TheraNest users with billing permissions will be able to access the Daily Billing Report. This report gives the per-day billing totals from all kept/invoiced appointments and accepted payments. It can be used to track practice-wide revenue. The totals shown in this report are based on the applied date range filters below. It can also be customized using the customize grid option. Then choose the dates for which you wish to see. Choose if you wish to see payments for archived clients, archived service types or only invoices that are fully paid. Archived Service Types are service types no longer able to be used for appointments or added to invoices. Applied Payments are payments that have been applied to an invoice. Unapplied Payments are payments that were accepted from the client but live in the Unapplied payments/credits and refunds section of a client's ledger and have yet to be applied to an invoice. 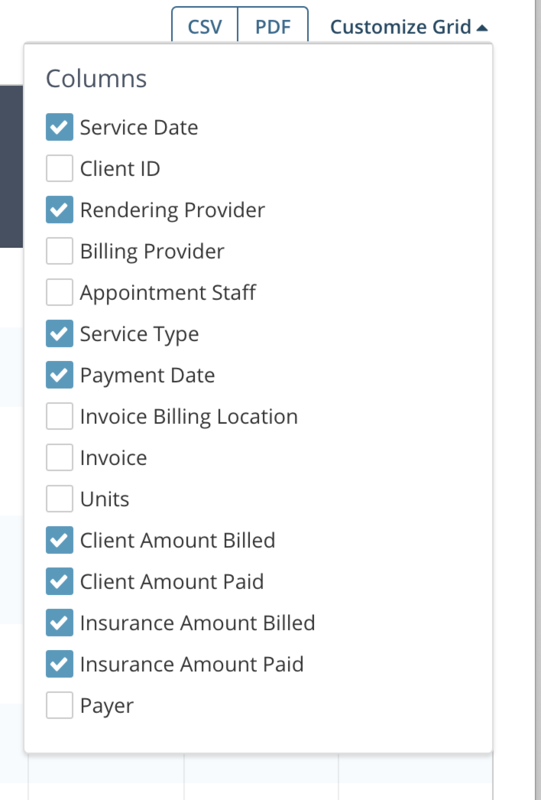 Here you can see the billed and paid amount totals based on the date range and date type you chose. When you click on CSV or PDF you can export the information that is displayed in the report. 3. Don't see a field you need? Click on Customize Grid in the right corner to see the additional columns/fields you can add to the report. Simply mark the box next to the field you wish to see and that information will pull in.